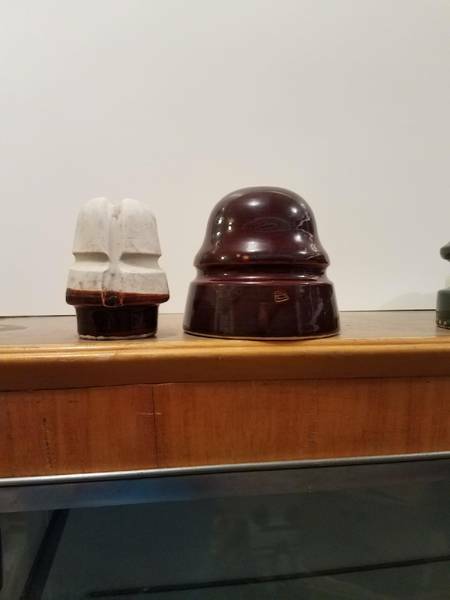 Porcelain Insulators > U-175 Locke re-united? A few years ago I purchased the inner piece off of eBay and several collectors laughed at me. Why did you pay that amount of money for only a piece of an insulator? This weekend I found the outer shell. Do they go together? I am not 100% sure but I think so. Looks like they do, but Elton has the U-175 as a glaze-weld. I don't know how the wire could be inserted in a glaze-weld. UPDATE. Elton has indicated that the Value Guide lists the U-175 as a two piece and it was a mistake to show it as a glazeweld in the Guide Book. The two pieces were held together with tar after the wire was inserted. Several other collectors have indicated that these go together. Unless someone can prove otherwise, I will consider this a complete U-175.